For well over a century, Monster Hunter International has kept the world safe from supernatural threats small and large--and in some cases very, very large. Now, join us as MHI opens their archives for the first time. 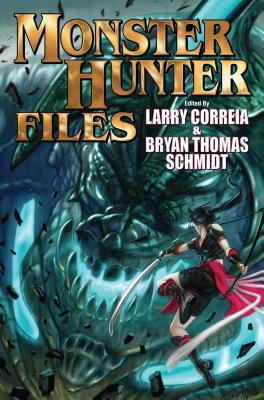 From experienced Hunters on their toughest cases, to total newbies' initial encounters with the supernatural, The Monster Hunter Files reveals the secret history of the world's most elite monster fighting force. Discover what happened when Agent Franks took on the Nazis in World War Two. Uncover how the Vatican's Combat Exorcists deal with Old Ones in Mexico. And find out exactly what takes place in a turf war between trailer park elves and gnomes. From the most powerful of mystical beings to MHI's humble janitor, see the world of professional monster hunting like never before. Featuring seventeen all new tales based on Larry Correia's bestselling series, from New York Times best-selling authors Jim Butcher, John Ringo, Jessica Day George, Jonathan Maberry, Faith Hunter, and many more. Larry Correia is an award-winning competitive shooter, a movie-prop-gun master, and was an accountant for many years. He is the creator of the Wall Street Journal and New York Times best-selling Monster Hunter series, with first entry Monster Hunter International, as well as urban fantasy hardboiled adventure saga, the Grimnoir Chronicles, with first entry Hard Magic, and epic fantasy series The Saga of the Forgotten Warrior, with first entry Son of the Black Sword. Correia lives in Utah with his wife and family. Bryan Thomas Schmidt is an author and a Hugo-nominated editor of adult and children's speculative fiction. His debut science fiction novel was The Worker Prince, which received Honorable Mention on Barnes & Noble's Year's Best SF of 2011, and was followed by sequels The Returning and The Exodus. His children's books include 102 More Hilarious Dinosaur Jokes For Kids and Abraham Lincoln: Dinosaur Hunter--Land Of Legends. Schmidt has edited edited anthologies Space Battles: Full Throttle Space Tales #6, Beyond The Sun, Raygun Chronicles: Space Opera For a New Age, Galactic Games, and, with Jennifer Brozek, coedited military high fantasy original anthology, Shattered Shields. Schmidt hosts #sffwrtcht (Science Fiction & Fantasy Writer's Chat) Wednesdays at nine p.m. ET on Twitter.